While working with many computers you do not know which license is assigned to which computer. But you need the correct details for a new installation. You must keep the installation CD and the Windows licenses carefully and distinct from one another for each computer, to be ready for an eventual new installation. In case you have forgotten the distribution of licenses, then you can ascertain the current status in the system. From Windows Vista fi rst click on ‘system and security’ in the control panel and fi nally on ‘system’. The subsequent dialogue presents the status and the product ID of your respective Windows version below in the paragraph. Then you can simply enter a new license key over a mouse click on the link ‘product key’. The user account control check requires your approval after the first click on ‘Next’. If the license key was changed then the system finally requires the renewed activation of its Windows license. 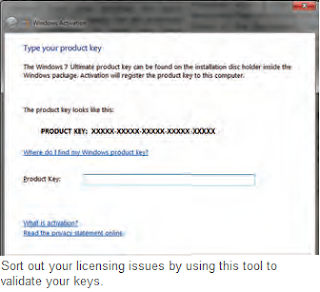 NOTE: This retrieval and even the alteration of the license key is possible directly in the control panel under Vista and Windows 7. Under XP you need additional tools, like for example Magical Jelly Bean Keyfinder or License Crawler, to determine the license key from the registry. Both the tools are available online.